In Toggl, a Client can have many Projects, but each Project can only have one Client. So, if you don’t typically work on an assignment/project basis, but want to keep track of services that you provide, consider entering your clients’ names as Projects. Click the Projects tab on the left side menu. Click the green “Create Project” button. A popup window will appear allowing you to name your project, select a client you wish to be associated to that project, apply a Project Template, select the color your project will be labeled with and choose if the new project will be public or private. You can create time entries in manual mode or using the timer mode (a live running timer). Click on the "folder" icon to get a drop-down list of projects and start typing the name of your new project. The drop-down list of suggestions will try to suggest a matching (existing) project name as you type. If you type a project name that does not exist you will be offered the option to create a new project. 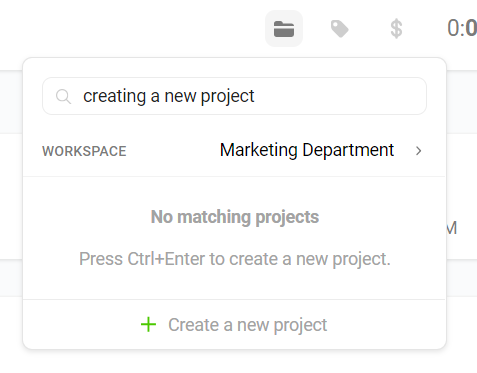 At this point, with the name of your new project typed into the search field you can either click on the "+ Create new project" button with your mouse pointer or use a keyboard shortcut Ctrl+Enter to create a new project. A popup window with additional options will appear allowing you to name your project, select a workspace (if you have more than one), assign a client, apply a project template and select if the project will be public or private. By default all projects are private. You can choose to leave the new project private or mark it as Public to make it visible for the whole team. Open this article for more details on access privileges. You can move your data between Workspaces by choosing another Project label. When editing time entries on Detailed Reports page pick a Project from another Workspace, to move your time entry to that Workspace. This feature is also available with Bulk Edit. Users on paid plans can create new projects faster by using the Project Template feature.